It may sound counterintuitive to run a burn under warm water, but it turns out that this is one of the best ways to stop the pain. Even minor burns can be agonizing, but warm water works to relieve the pain and increase circulation to damaged tissue by expanding your blood vessels – as opposed to cold water which restricts them. Severe nosebleeds can lead to a serious amount of blood loss. To treat a nosebleed, most people lean their heads back. But instead, you should start by leaning forward so that the blood doesn’t run down your throat. Next, use a tissue or cloth to gently squeeze your nostrils shut. Continue leaning forward and applying pressure until the bleeding has stopped. Some insects such as bees will leave their stinger inside your skin when they sting you. It needs to be removed, but you have to be careful doing so. Squeezing the stinger with tweezers can cause more of the insect’s venom to be injected into your skin. Instead, use the edge of a credit card or a dull knife to gently scrape out the stinger. Just be careful to ensure that you are pushing it in the right direction; you don’t want to be pushing it further into your skin. Without any kind of medicinal treatment, sore throats can be a real annoyance. One easy, medicine-free method of soothing a sore throat, though, is to gargle salt water. I highly recommend you try this before taking medicine or sore throat lozenges. You’ll be surprised at how well it works. Bites from mosquitos, chiggers, and other pesky insects often itch so bad it’s almost unbearable. This is especially a problem if the situation requires you to spend a lot more time in the woods than you might have before. In lieu of anti-itch cream, though, you can use a paste made from baking soda and water to stop the itching from insect bites. Just put one tablespoon of baking soda in a bowl and slowly add a little bit of water while stirring until a paste is formed. If you have suffered a sprained or strained ankle, it’s important to elevate it above your heart. Elevating a sprain above your heart reduces blood flow to the injury, which in turn prevents swelling. This is part of the RICE method. Which stands for Rest, Ice, Compression, and Elevation. 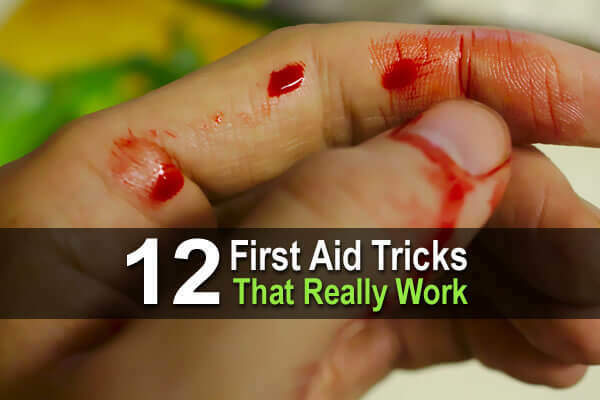 There are a lot of first aid myths centered around treating snake bites. One of the most persistent ones is the idea that shocking a snake bite will neutralize the venom. Before you hook yourself up to a car battery, though, you should know that this has been proven false. Even slicing open the fang marks and sucking out the venom – once standard procedure for treating snake bites – is now thought to do more harm than good. The unfortunate truth is that venomous snakes are efficient killers, and short of antivenom, there is no proven way to neutralize the venom they inject. One thing you can do, though, is to splint the limb that was bitten to restrict movement. Moving can cause the venom to spread further into the body. From there, though, you should always seek medical treatment if it is available. In a world where medical treatment is not available, avoid venomous snakes like the plague. If you find yourself suffering from a heart attack, one of the best things you can do short of seeking immediate medical help is to chew up an aspirin tablet. Taking aspirin within thirty minutes of the initial symptoms of a heart attack has been shown to greatly reduce the damage to the heart, prevent future problems that often develop after a heart attack, and, in many cases, actually save the patient’s life. If you have a history of heart problems, it’s a good idea to carry some aspirin with you everywhere you go. One of the dangers of seizures is the risk that the victim will choke to death on their vomit. To prevent this, standard procedure is to always roll a seizure victim onto their side and hold them there for the duration of the seizure. Here is some more information on how to help someone having a seizure. If you’ve seen all of the action movies where the unphased hero nonchalantly jerks an arrow or a knife from their body, you may think that removing the object from the puncture wound is the best course of action. In reality, though, it only speeds up blood loss. It’s important to wait to remove a knife (or another penetrating object) from the body until you are ready to immediately commence other procedures that will stop the bleeding. It’s equally important though, that they remain still while the object is still inside them. In the case of knives, arrows, and other objects with sharp edges, moving can cause the blade to rub against tissue and blood vessels, leading to further damage. Nausea can come from a wide variety of causes, but no matter the source it is rarely ever enjoyable. One great and easy way to treat nausea, though, is with peppermint tea. To make peppermint tea, simply take peppermint leaves and boil them in water. Drink the tea warm and it will help ease nausea, sometimes making it go away entirely. If you or someone you know is suffering from the symptoms of frostbite – tingling, numbness, swelling, and blisters – it’s important to treat it right away by running the affected area under warm water. It’s a natural reaction for people to try and rub their hands together to warm them up from the friction, but this should be avoided in the case of frostbite, where rubbing can damage sensitive skin and tissue.